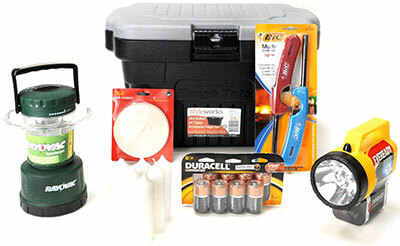 Storm Survival Kits are great to have and to give… everything-you-need-in-one kit. We’ve developed three of them, without any duplicates. Buy any 2 and save 10% off the total price. Buy all 3 and save 15% off the total price. Don’t let the next storm catch you unprepared. 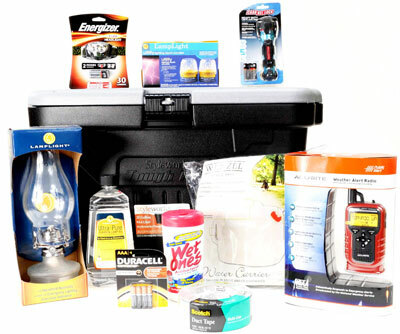 This basic storm survival kit contains candles, lanterns, batteries, lighters and a tub stopper, which all fit in 10.5 gal Tough Tote keeping all of your storm basics secured with a padlockable latch. Plenty of room to add more items available at Woodstock Hardware; your storm essentials one stop shop. When you fear the next storm with power outages, get this Survival Kit. The 25 gal Tough Tote (with padlockable latch) will securely hold your storm essentials all in one place. Start with being able to use both hands as you work your way through the next storm by wearing an LED head lamp, lamp & oil, flashlight & batteries, utility light, as well as weather radio will help you get around during a storm and keep you a bit more comfortable. Water container & wet ones for personal safety and health also included, plus duct tape for those quick emergency repairs. Don’t be left out in the cold. 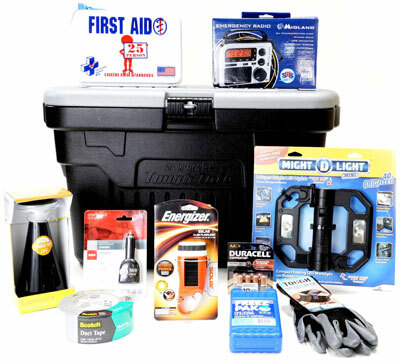 This Storm Survival Kit includes a weather radio, lamp, flashlights and work gloves, all necessary for every possible power outage and the next “NorEaster” storm. With USB charger, freezer pack, first aid kit and duct tape you will be prepared for longer outages and quick emergency repairs. Keeping this kit all together in the 25 gal Tough Tote (with padlockable latch) will ensure you have these items at your fingertips in a moment’s notice.